FEATURE: Four-time winner of the Women’s EHF Champions League, Cristina Varzaru, announced her retirement at the end of the season. There are moments when your body tells you to stop, but your mind is not fully decided about what comes next. Cristina Varzaru beat her body and toyed with her limits in 2012 and continued to play handball – while also continuing to ponder retirement. 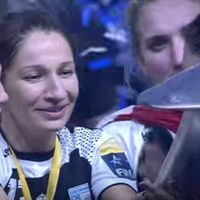 She did not think for a second that five years later, she would leave handball on a high with another Women’s EHF Champions League trophy in her cabinet, as well as three Romanian national titles and two Romanian Cups. “When I came back to Romania after several amazing years with Viborg, I signed with a CSM side that was a middle of the road team, thinking about how my life would be after I leave handball,” says Varzaru in an exclusive interview with ehfCL.com. It was in this moment that Varzaru told herself to keep going until her body cracked. A long series of knee injuries hampered the right wing since her time in Viborg, but another setback, in the autumn of 2016, helped the 37-year-old to sign off on her own terms. “Mentally, I was prepared for the situation, because one of my knees could not keep up. I knew this was going to happen eventually and I was fully prepared. My body gave everything it had and helped me achieved beautiful moments on the handball court,” says Varzaru. Varzaru started handball at her local club, CSS Corabia, but her talent was soon spotted and helped her land a place in Oltchim Ramnicu Valcea in 1997. After five years at the most decorated Romanian club, Varzaru left for Rapid Bucuresti. In 2005, the right wing made arguably the best decision of her life: to join Viborg, the team she has the fondest memories of. Alongside teammates like Bojana Popovic, Kristine Lunde, Katrine Lunde, Henriette Mikkelsen, Grit Jurack and Anja Althaus, Varzaru completed a dream team that won the Women’s EHF Champions League three times. The Romanian ace won the Women’s EHF Champions League top goal scorer award in 2010 with 101 goals, three more than Alexandra do Nascimento, becoming the first Romanian player to achieve this feat before Cristina Neagu in 2015. “I think Viborg was an amazing period for me, but I can’t say that it is my favourite time in handball. I think every title won, every defeat and every minute played on the court helped Cristina Varzaru mould into a player and a human being,” says the 37-year-old. Varzaru says she is leaving handball with her head up high, without any regrets, not even the painful injuries that sidelined her for several years. However, it is the recurrent knee problems that mean the Romanian player can no longer continue her career, 20 years after she made her debut for Oltchim. “The injuries are part of sport. And this means I would not change anything in my career, not even my knee pains or a 17th place at the World Championship with the Romanian national team,” says Varzaru. Arguably the biggest surprise of her career was winning the Women’s EHF Champions League with CSM Bucuresti in 2016. Varzaru is retiring with a 100 per cent win rate in finals of Europe’s premier competition. With four titles, she sits behind only her former teammate Bojana Popovic and Ausra Fridrikas on the list of record Women’s EHF Champions League winners. “My handball career transformed me in what I am today. I did not think for a second I would reach such heights,” says Varzaru. So, what next for the Romanian stalwart? “I love handball and I will continue living the dream, in one way or the other. My goal is to help promote handball and Romanian handball from another role. What role that is remains to be seen. Only time will answer this question,” concludes Varzaru.